No day is ever the same as the previous one; most days throw up something unusual or unexpected or even quirky. In the week before Cleddau resumed her 2011 cruising her crew had cause to visit Cambridgeshire, briefly, by car. They stood at Hermitage Lock, near Earith, reminiscing about last year’s cruise from Macclesfield to Bedford. A sleek and shiny, very smart river cruiser came into the lock. Have you been on a long trip?” Boatwif shouted down to the skipper. Such boating epitomises a life of carefree gentle floating – isn’t that what all or at least most boaters desire? Off Cleddau set this morning, through Cosgrove Lock, pausing a while to attend to sanitary and water matters. The cruise was resumed and Cleddau sallied through Soloman’s Ornamental Bridge and out into open countryside. The crew enjoyed a mid-morning cup of tea, the washing machine churned, the floor was washed. All was efficient on the domestic front. Meanwhile travel progress was slow: in front of Cleddau was a narrow boat and in front of the narrow boat was a widebeam boat, moving very slowly. “At this rate there’ll be a queue back to London,” the Captain muttered, almost too softly to be heard. The sun shone, the Northamptonshire fields were neatly cropped, the sheep were gently grazing. Then, about half a mile from the base of Stoke Bruerne Locks, came the first hint of a hiccup to the day’s plan. “Locks are blocked, barge stuck in one,” announced a fisherman. 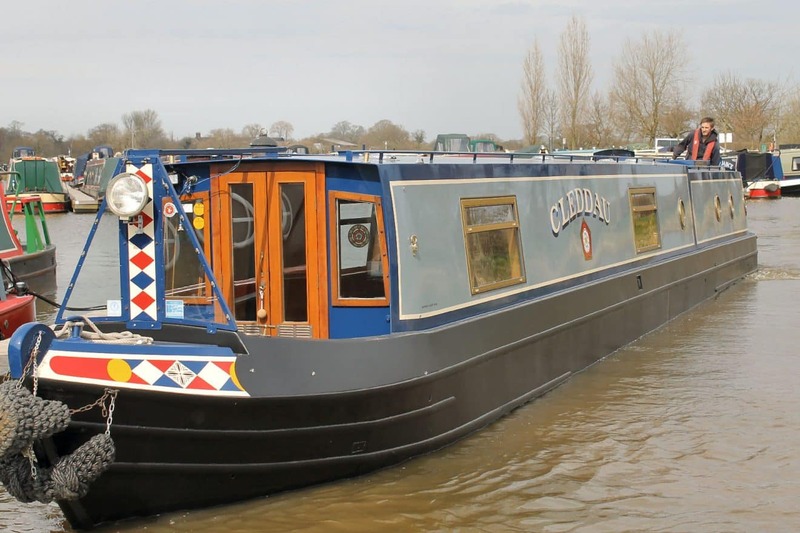 Cleddau was moored at the bottom of the seven locks, a line of waiting boats in front of her. Mrs Local Boater conveyed similar information: “Chaos up there, boats everywhere, British Waterways have been called.” Her husband was relaying information down the cut by mobile phone. While the Captain did male talk by the boats Boatwif strolled up the hill. No boats were moving, yet the pounds between locks were filled with moored up craft. At Lock 2 people gazed into the chamber. There, turned at a precarious angle, was a narrowboat, its stern just on the cill at the back, its bow partly under water at the front of the lock. Teams of BW staff were summonsed. How she was lifted was not observed, but towpath talk is of pumping out water so as to straighten the boat, a gentle bringing back up to full lock height and a hauling out of the lock. The crew of man, woman and cat are unhurt, but no doubt shocked. As time stretched on the decision was to moor there overnight – and then boats emerged from the bottom lock. An hour later (four hours after arrival) Cleddau reached the front of the queue, so up she climbed; 7 double locks, the half-mile stretch to the (drippy) Blisworth Tunnel, the Tunnel itself plus a mile or so afterwards , nearly to Gayton Junction.